My graduate work in the Master of Arts in Educational Technology (MAET) program has provided me with new insight into not only the use of technology in my teaching, but also into how to be a true leader in my school and in my personal learning network (PLN). In addition to simply learning about technology, I made a conscious effort to use technology to help streamline my processes, improve lesson plans, and utilize technology resources as tools for learning within my course of study. With this knowledge, I feel that not only am I better able to manage and utilize technology in my own classroom, but I am well suited for instructing students in flipped learning and online learning environments and am ready to be a leader in technology within my school and PLN. 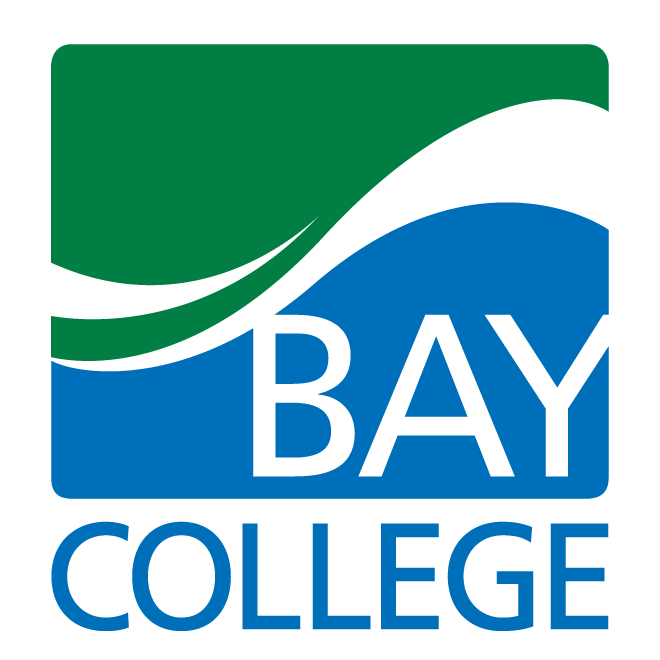 This project focused on the creation of an online course. I chose to take this in a direction that I could relate to my own classroom, so I opted for a "blended" model for my course, meaning that the students receive all of their instruction at school, but incorporating online and virtual experiences done independently or in small groups. To give a taste of what a class period looks like, I created three comprehensive lesson plans to include in the course, as well as an additional page for teacher administrators (password is 'monkey') detailing classroom setup, standards, accessibility options, technology requirements, pacing, student outcomes, and directions for teacher implementation. More than any other artifact, I feel this sample exemplifies my abilities in learning and teaching, technology integration as a tool for learning (rather than the focus of learning), the use of standards, cognition of learning differences, and actual content knowledge. 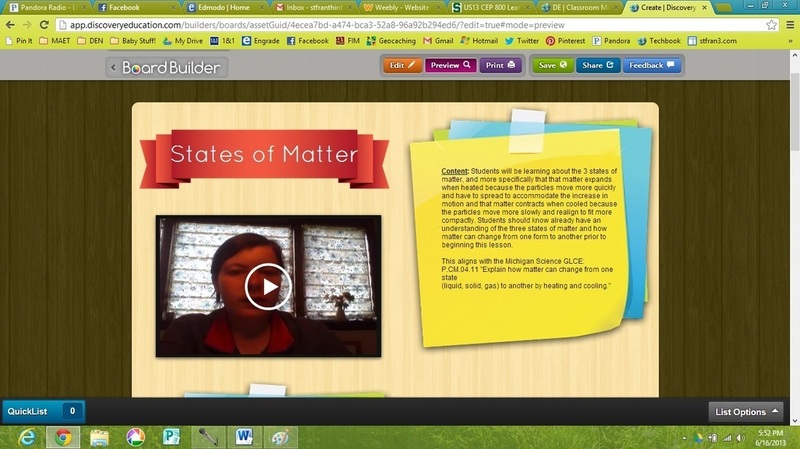 Rather than focusing on an entire course, this specific artifact is an inclusive lesson plan on the states of matter. For this project, we were asked to use a specific technology to supp﻿ort the learners of the lesson planned. I chose to use the Discovery Education Board Builder tool to meet this requirement, but I also decided to present my lesson using this tool. The lesson itself is built on the TPACK (Technological Pedagogical Content Knowledge) framework, considering the interests and abilities of my students in conjunction with the technology available and appropriate for their learning. In focusing on the relationships between technology, pedagogy, and content knowledge, I was able to create a well round lesson to meet the needs of the learners in my class. Making the scope of teaching even more focused, this sample is a teaching tool that I created and shared online for other teachers to use in their classes. 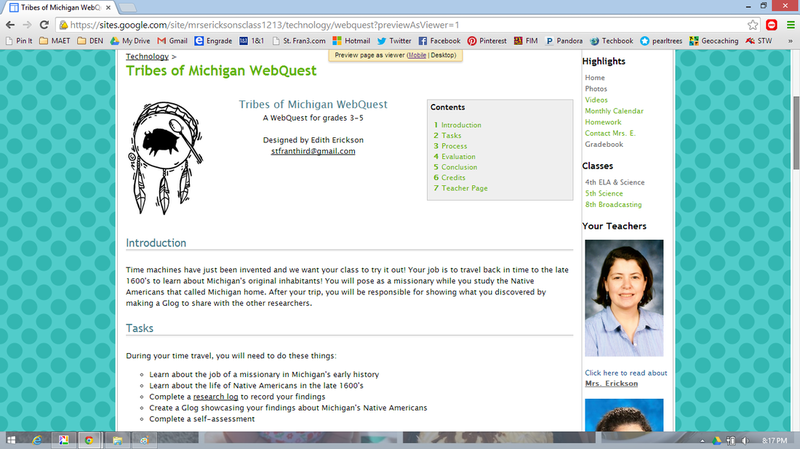 The artifact is a WebQuest that I created to focus on the Native Americans of Michigan. In the WebQuest, the students are pretending to be a time traveler disguised as a missionary who is interested in studying the tribes. The students first have to learn their "cover story" by researching missionaries, then learn about different aspects of Native American life in order to be accepted by the tribes. All of the student notes and activities are recorded in a guided research log housed in a Google Doc. The WebQuest page guides students through the entire activity, but I also chose to include a page specifically for teachers as well. In being a leader in my school, it was important to take stock of the resources available, create goals for further implementation of technology, and to create a plan for achieving those goals. In this assignment, I was asked to do all of those things, in addition to creating my technology vision and thinking of the the possibilities and pitfalls of this plan. 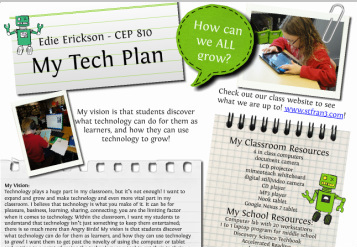 Created in one of my first MAET courses,this began my transition for self-contained classroom teacher to technology leader. I was able to think on a grander scale than my own classroom and in doing so, began thinking of how to help all of the students in the school, not just those in my class. Part of being a leader is making choices that will impact both students and teachers, so it is important to make decisions that are based on sound research. 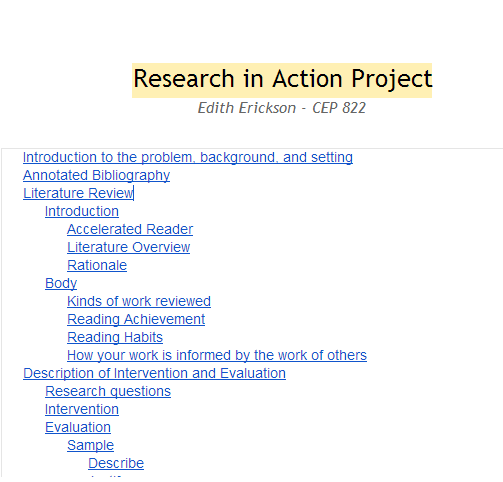 This project shows how I was able to utilize the results of research to plan for action in my school. This shows that I am able to not only locate information, but that I can also use this information to problem solve and think towards long term solutions to the problems in question. In addition to the research, funding and sustainability were keys to the planning of this project. In my very first assignment in my very first course of the MAET program, I was asked to create a visualization of my personal learning network, or PLN. I was not familiar that I even had a PLN, but by visualizing it in this way, I was able to see the support network that I already had in place and that has come to be an invaluable key to my success in the MAET program. Additionally, it has made me more aware of the teachers around me and has really inspired me to connect with and learn from those in my own community, both online and in person. 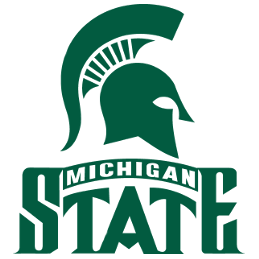 Throughout the MAET program, there have been a number of group projects that have helped to expand my PLN to include other students at Michigan State University who are going through the MAET program as well. One of my favorite projects was the creation of a special interest group, or SIG. 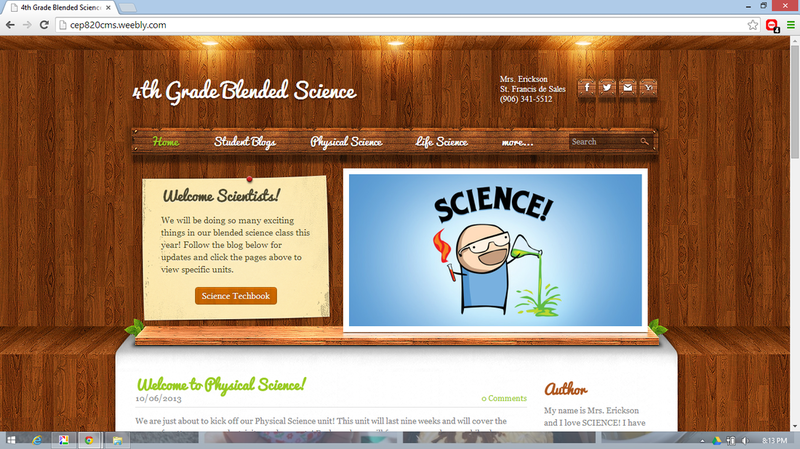 My group members and I chose to focus on the idea of flipped learning and created a website to showcase our SIG. As the group leader, I volunteered to set up the website formatting and also devised an acronym for explaining flipped learning. The "FLIP" acronym that we created, standing for Functional format, Learner motivated, Individual attention, and Performance enhancer. During my time in the MAET program, I have made a concerted effort to try out a variety of technology tools, choosing something new and different every time the opportunity presented itself, a tactic I enjoy employing in my classroom instruction. One instance was in the creation of this "Passion and Curiosity" project where I was instructed to "create something with something". I chose to make a video using the PowToons website, something that I had not used in the past. In making these choices, I sometimes struggled adapting to the new tool, but found that in the long run I was able to learn more than if I had chosen to use an easy or familiar tool. I chose to include this artifact because I feel like it shows my ability to take a tool and use it to meet the needs to a problem. In this case, I had to tell a story about how I address a specific learning situation in my actual classroom. This digital story focuses on meeting the goal, while using technology as a means to reach than end. One of the best lessons learned throughout the MAET program is that student learning needs to come first; the technology should only serve to support that learning. I think that this story showcases that belief, while also showing my mastery of technology use and integration.